Forum Home > Non-Seiko 7Axx Discussion Area (Re-branded mvmt's) > My newest incoming Yema N8 - and a gap in the collection filled. 2012 has been a good year for me, in terms of Yema N8 collecting. It started in February with a very nice Yema Flygraf. More recently I've splurged (there really is no other word for it) on three NOS 43mm Spationaute III's. Well, they are a particular favourite of mine. There weren't many other Yema N8 models left, of which I didn't have an example, except for a couple of dressy gold tones I knew of. But the lack of one of them, in particular, had been bugging me for some considerable time. Back in May 2010, I'd seen my first (and until very recently the only) example of a dressy model # N8YX53 listed on eBay France. 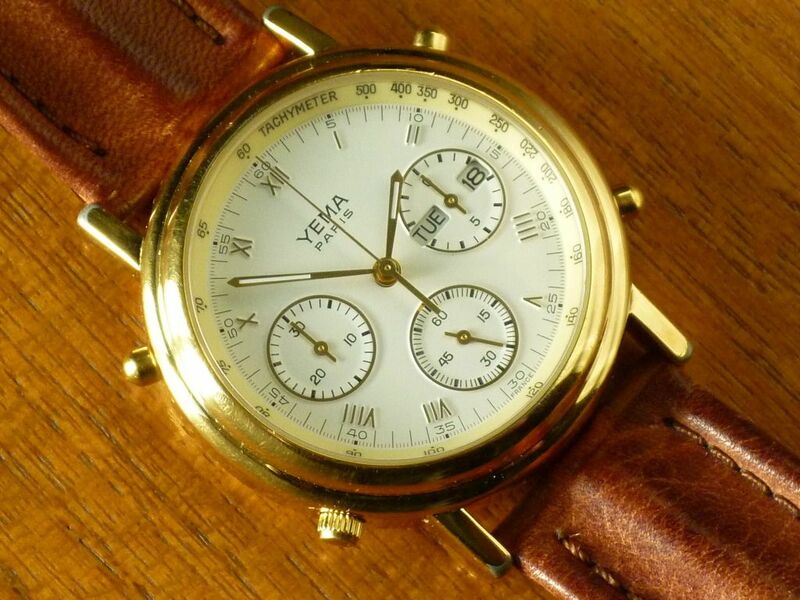 The seller had a reserve set at something like 100 Euros, IIRC. I bid on his first couple of listings, but failed to meet the reserve. 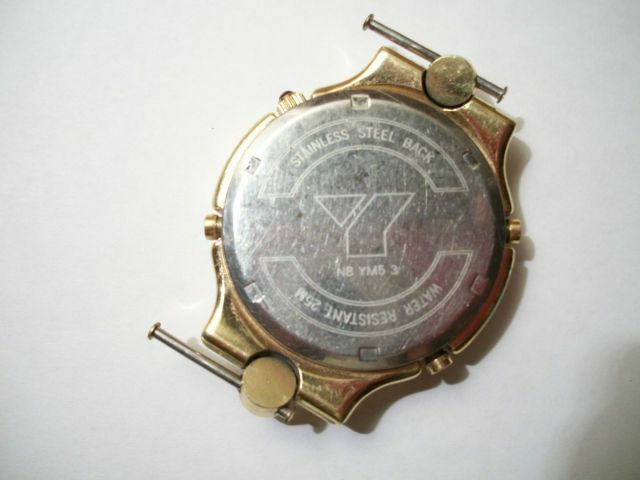 It wasn't in the greatest of shapes, with heavy wear of the gold plating and a very badly scratched (read butchered) caseback. It might look OK in the first photo (from his original listing), but the seller sent me all the original high resolution shots he'd taken. He re-listed for it a second time in September 2010, by when I'd already seen enough, and decided to pass on it, regardless. The seller must have lowered his reserve price because it sold for 90 Euros. Of course, then I never saw another one after that. .... one finally came up on LeBonCoin in the last week of November, asking price 90 Euros; looking to be in rather better condition. I frantically messaged the seller through LeBonCoin, in my best schoolboy French, asking if he'd consider shipping it to England. Disappointingly, I received no reply to my messages, which I must say I've found fairly typical of many provincial French sellers. But having missed the first one, and realizing that these must be comparatively rare, I wasn't going to give up so easily this time. So I emailed Dominique M., a french space watch collector, who I'd met through Forumamontres and enlisted his help. Dominique was coming over to England for Christmas shopping, in London, the first weekend in December and had planned to bring the Yema with him and post it from there, but unfortunately it didn't arrive before he left. So he posted it by 'Colissimo' as soon as he returned. Colissimo is a French express parcel service. Worse still, the UK delivery side is handled for Colissimo by ParcelFarce. Two missed attempted deliveries later. It finally arrived about 10 days ago. Condition was much as I had expected. Pretty decent, but with some gold plating worn off the lugs. Dominique had pre-warned me the seller had informed him it had a flat battery. 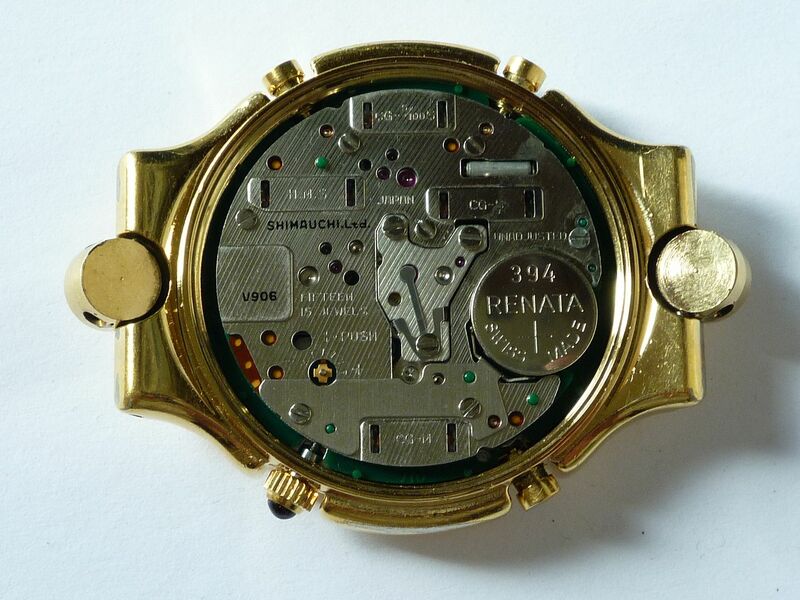 I gingerly unscrewed the case-back to find a pristine, almost gleaming Shimauchi V906A movement; fitted a new Renata #394 battery and everything worked first time, much to my relief. The main issue for me was finding a suitable strap. Prior to it's arrival, I'd incorrectly assumed it would have a 20mm lug width fitting. It turned out to be 19mm. I should have guessed because a couple of other dressy Yema N8's (N81W53, N81W63) were also 19mm. 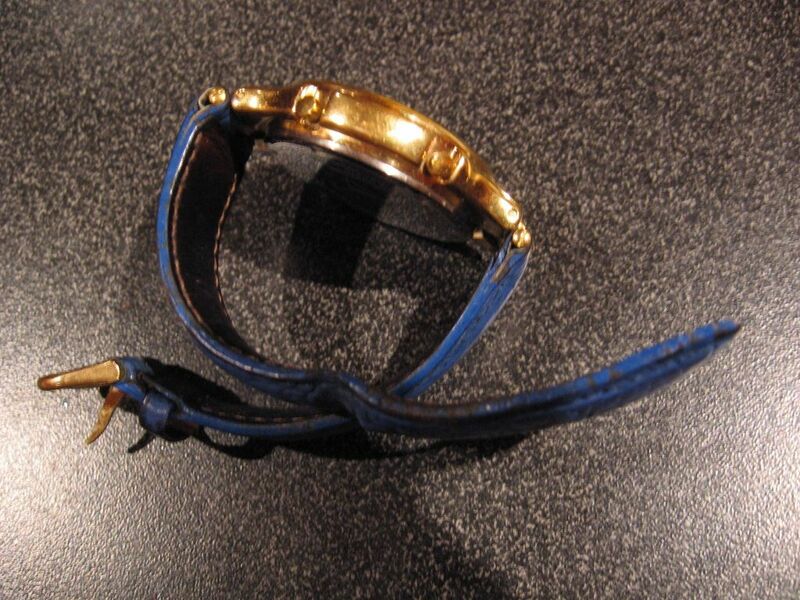 The blue shark 'double jonc' strap shown in the French seller's photos was only 18mm wide and literally disintegrated as I unpacked it. See: http://www.cousinsuk.com/catalog/10/669/2520.aspx for the full Bellini range. 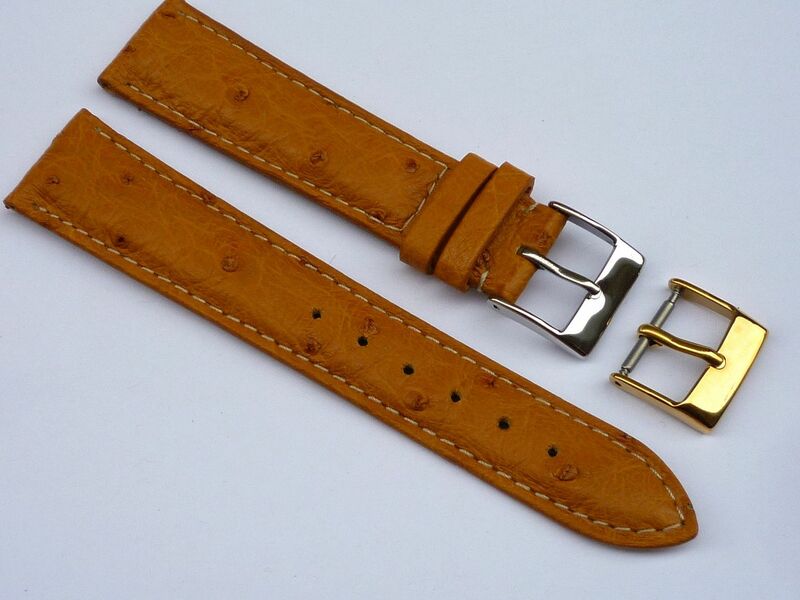 The quality of these Bellini straps is reputed to be excellent, but I was concerned about whether it would be thick enough at the lugs, and also wanted to find out by how much the 19mm strap tapered to the buckle, because I prefer leather straps with a mimimal taper. Seems I'd made the correct decision in the absence of information. Meanwhile, I'd been looking elsewhere, fruitlessly. Even Watchband Centre didn't offer a strap which fully met my requirements. 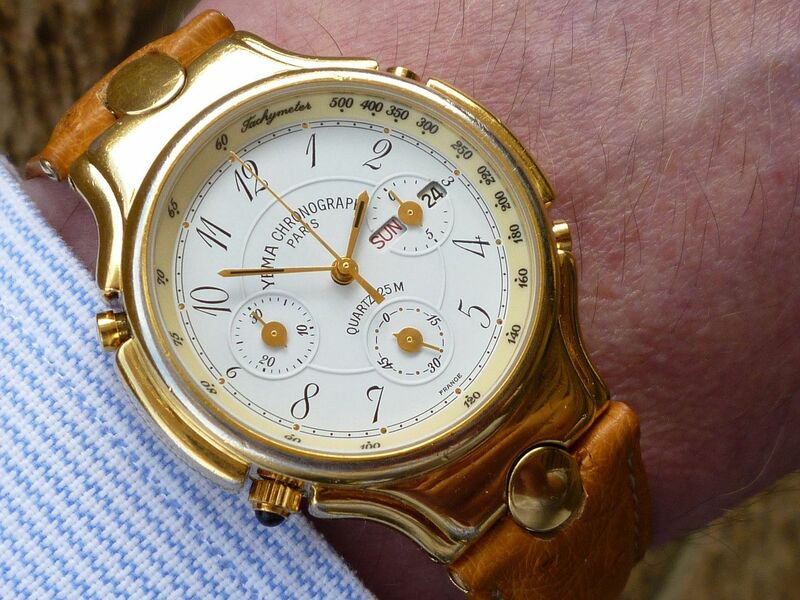 They do list a 19mm Ostrich strap which tapers to 18mm - the Graf 'Burma', but describe it as 'thin', with a thickness of only 3.0mm. Apart from that, their price of 52.45 Euros was double that of Cousins' 'Bellini'. Luckily, my spare strap drawer yielded an alternative solution - an original Yema 19mm strap which I'd earlier removed from a N81W53. Nice - I really like the embossed Roman numerals. Thanks, Simon. 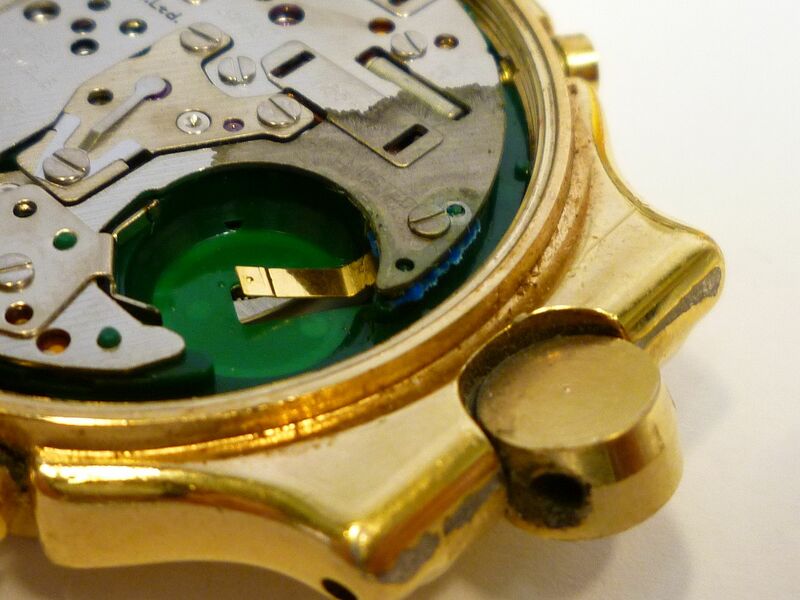 I haven't popped the movement out yet, but I suspect the sub-dial rings and raised Roman numerals are all moulded in the presumably plastic dial. Head on, it doesn't look anything spectacular, but with it's very lightly domed crystal, when the light catches it right, the dial itself is really blingy. That's what I tried to capture in my third photo, but without getting a reflection from the crystal. Perhaps I inadvertantly made the right choice in fitting that particular Yema strap to my N8YX53, rather than something more exotic. As I mentioned in another thread in this section, a french contact, Daniel, had kindly sent me some photocopies of a Yema catalogue. 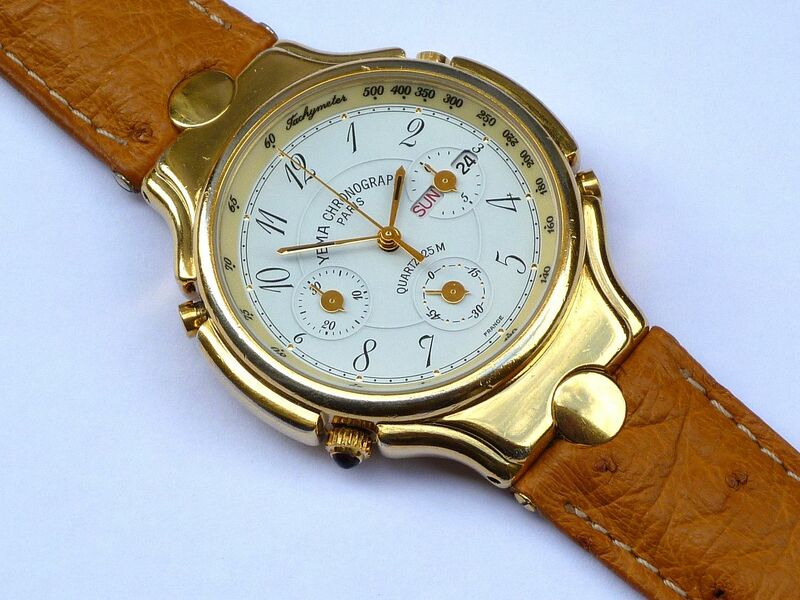 Note that in the catalogue, the model number N8YX53 has a suffix AW (which isn't stamped on the case-back). From what I've gleaned, so far, that suffix designates the variant within the case model. 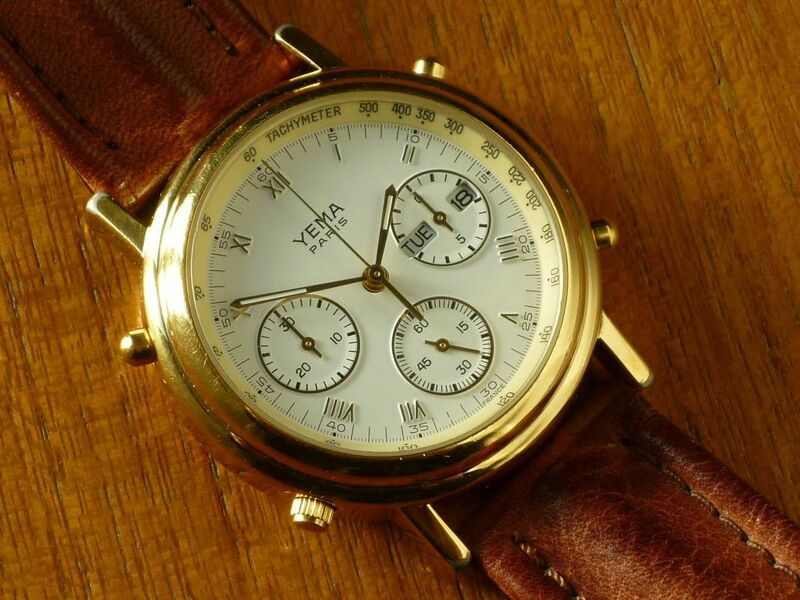 Thinking about the other rather more elaborately cased dressy Yema N8 models, the N81W43, N81W53 and N81W63 - each of them have two distinctly different versions of dial. So perhaps there exists another variant of N8YX53 waiting to be re-discovered - possibly with plain batons or Arabic numerals. But I haven't seen one yet. 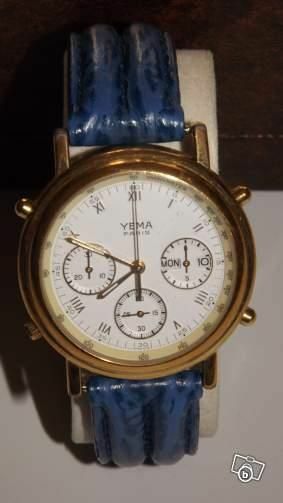 My newest incoming Yema N8 - and another gap in the collection filled. More 'dressy' N8's than anybody with even a modicum of good taste should ever admit to owning, including some 'doubles' and both dial variants of the N81W43 (shown at right), N81W53 and the exceedingly blingy N81W63 - for starters ! I've written about the last mentioned 'dressy' N81Wx3 versions on this forum a number of times before and the N8XY53 in this thread. 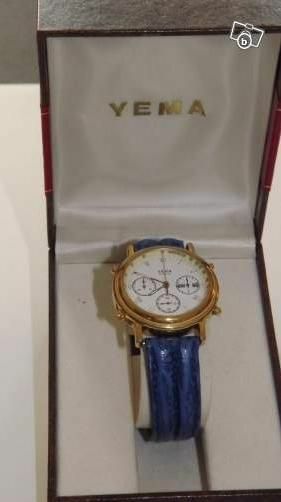 But there is also another 5th very dressy Yema N8 model, I discovered long ago, which I hadn't mentioned on this forum previously. I did actually write about it here in a thread on RLT, way back in January 2010 - the last time I mentioned it anywhere, I think. 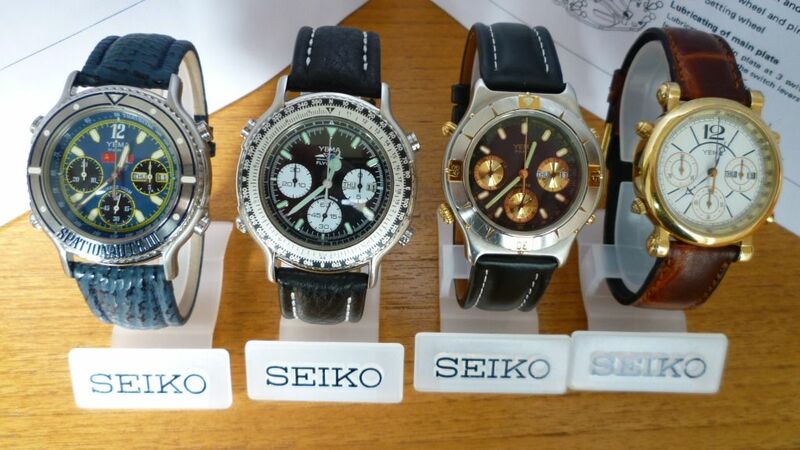 Yema 'divers' Watches Using Seiko 7a38 Movements ? So that's 5 different Yema '7A38' models identified so far. I wonder how many more they built ? Let's just say that I was still learning about Yema at the time. That photo (and link) are from a 'Friday wear' thread (although checking the original photo's properties it was taken on 26/11/2005). - a comment on Yema's then very recent bancruptcy, which translates as 'A little thought for them before Christmas'. 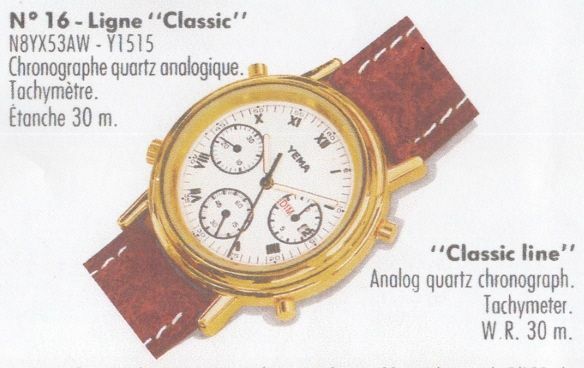 Il s'agit d'un chrono à quartz de la fin des années 80 (on notera le look du boitier assez proche des Ebel de l'époque). Yema s'essayait à l'époque dans le "haut de gamme" à quartz. "Complication" interressante, la seconde foudroyante sur le petit cadran à droite. Maintenant, une petite leçon française. Guinness' choice of the word Foudroyant(e) is an interesting one. It appears to have multiple meanings, depending on context used in. 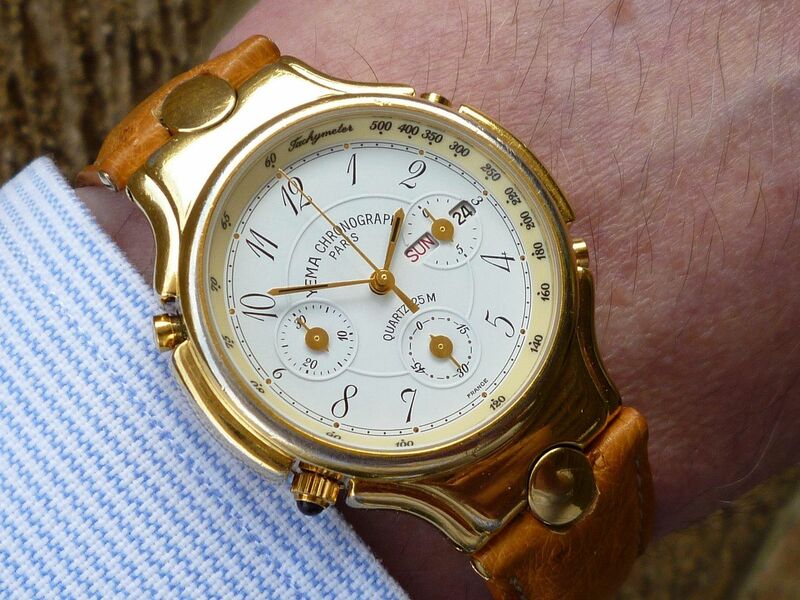 A foudrayante (chronograph) shows real-time split seconds with a rapidly spinning hand that makes a revolution every second. My reason for wanting to contact the OP was simply to find out the Yema N8 model number - for my records. IIRC, I first tried to contact him by PM through Chronomania.net - without success. Seemed he had moved. His name is Franck - hence the play I made on his name, in my post on RLT, referring to him as a 'Franck-ophile'. Thankfully Franck wrote very good English - a lot better than my Franglaise, anyway. 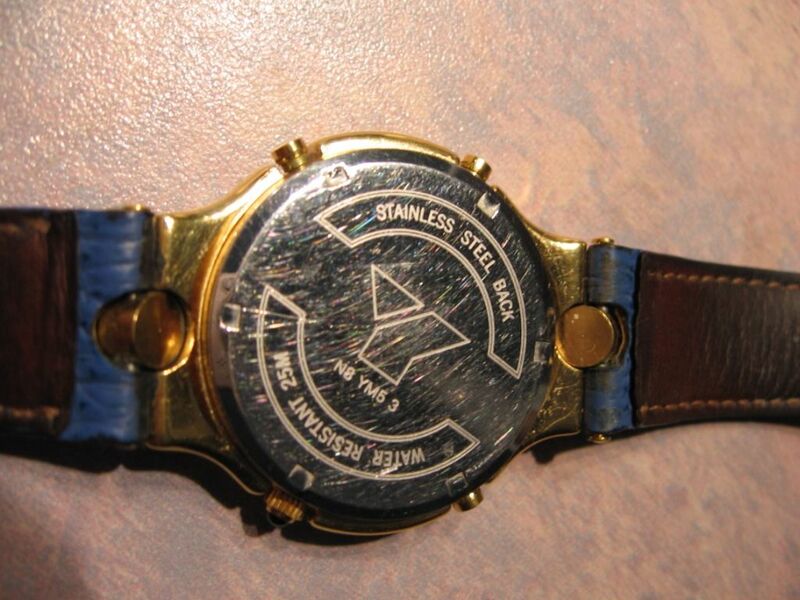 Yes, I still own this watch and wear it sometimes even if it has a quite 80's design. What do you want to know about it ? 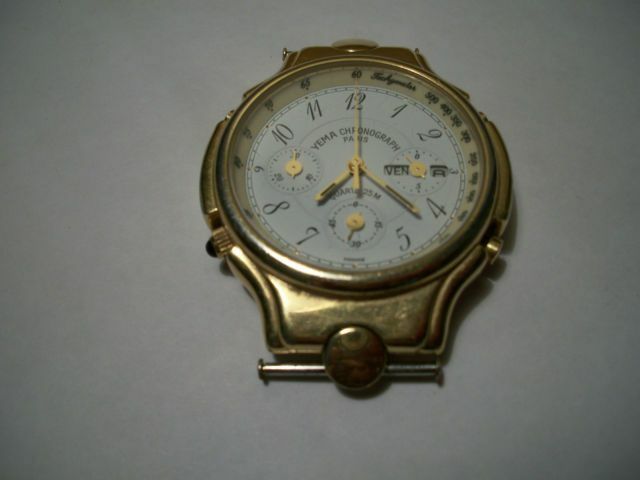 The reference at the back of the watch is : "N8 YM5 3". 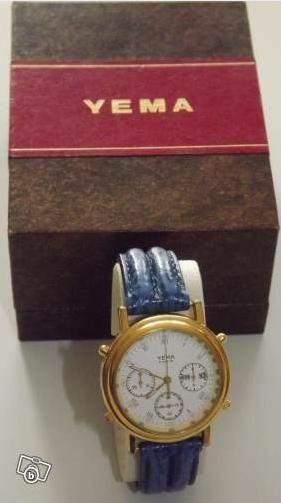 I always thought this was an ETA caliber in this watch. You can see a ruby on the top of the crown at 8 o'clock. Let's go back to my Yema. I have included some pictures. 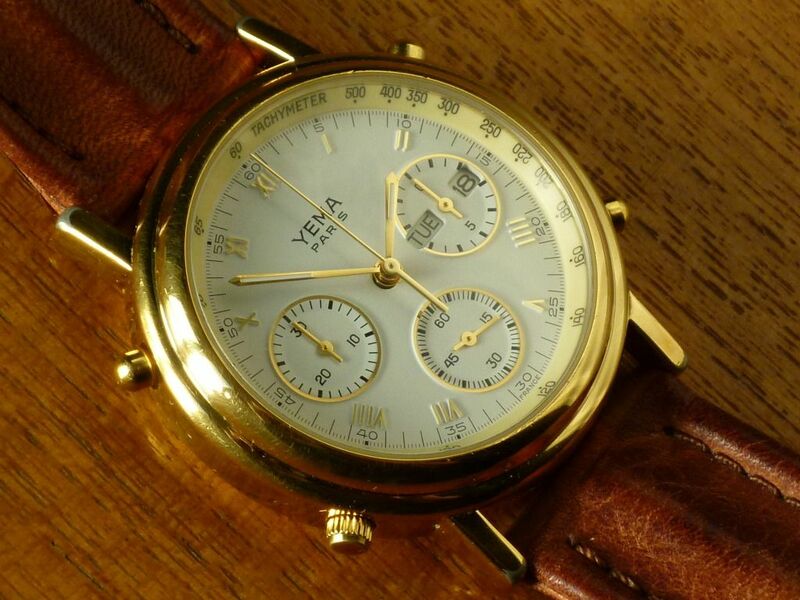 Had a look to the thread in "thewatchforum", it is very interesting. You can use any picture and information I gave you, no problem. 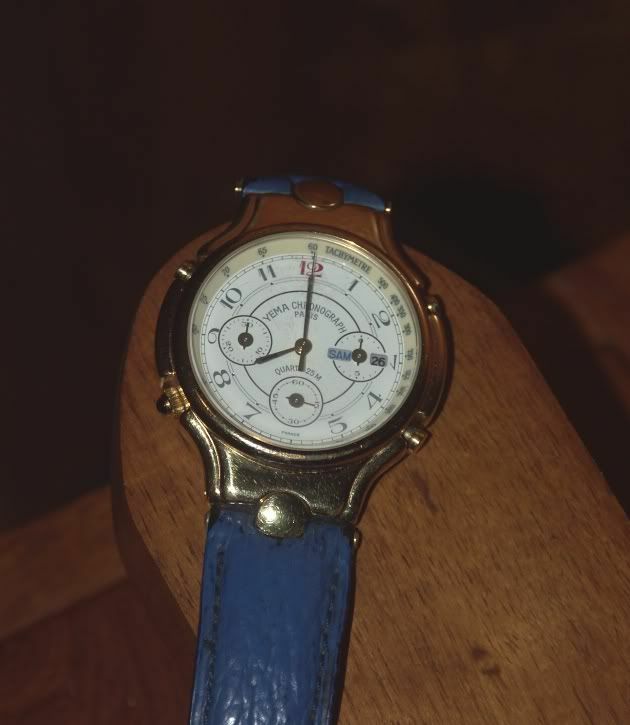 This watch was bought by my father in 1987 or 1988 in Paris. The list price was around 4500 Francs if I remember well. 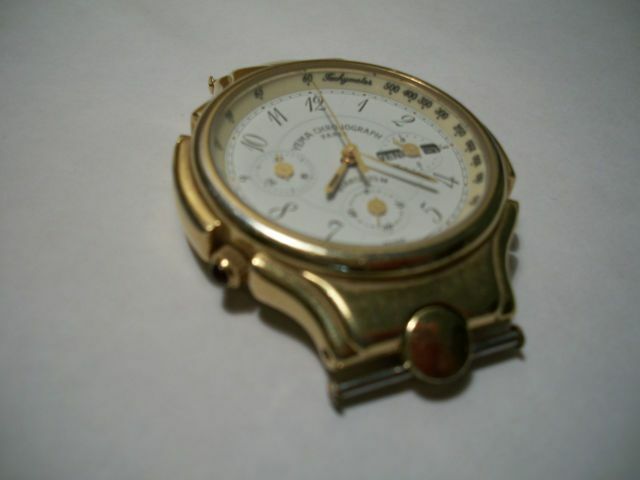 I got the watch in 1991 when my father passed away (I was 20 then). 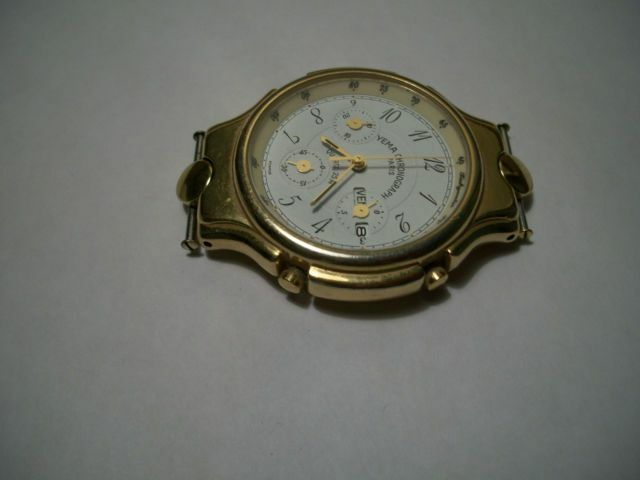 The original band was a light brown in buffalo skin; I still have my father's one, but it is in very bad condition. I changed it to the current blue shark one. 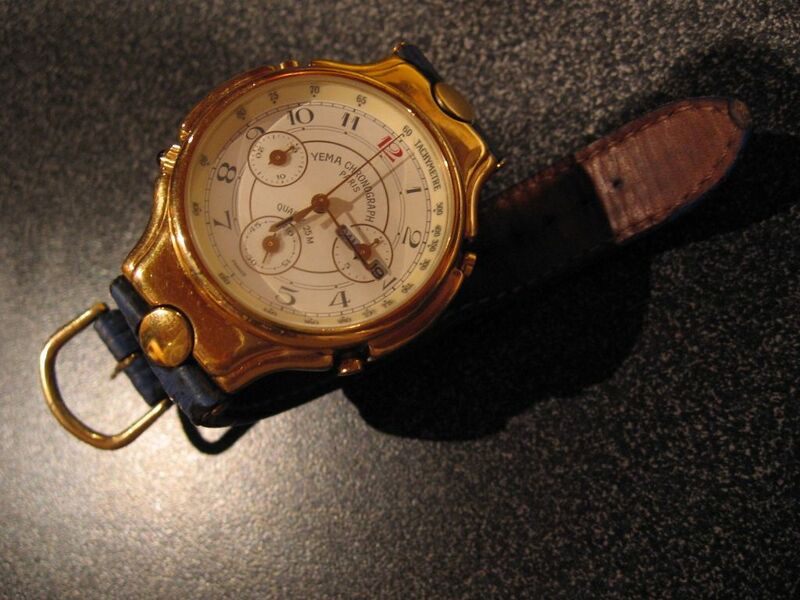 The blue shark - because of Breitling, it was fashionable at the time. What else to say about it ? If you have other question, go ahead ! ... well, at 1 millions dollars, we might start to talk. 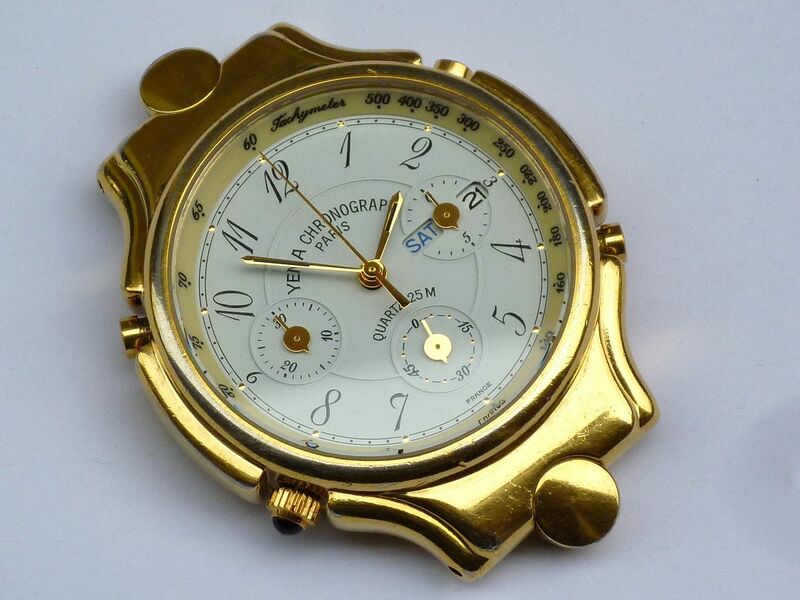 Needless to say, in the circumstances, I would never have dreamed of making Franck any kind of 'silly' offer for his late father's watch. 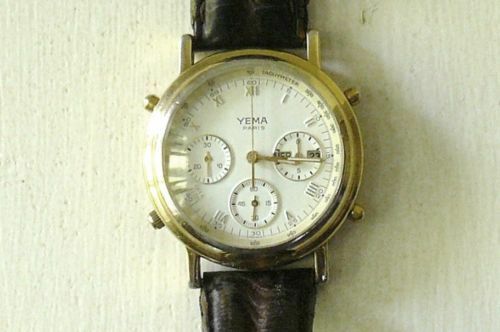 Thing is, despite all the hours I've spent searching eBay and LeBonCoin, I've never seen another Yema N8YM53 anywhere since then. Not in 3½ years ! 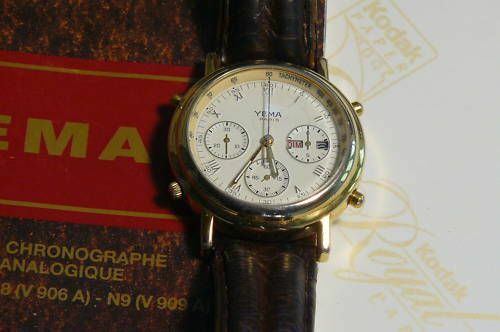 Ancienne montre Yema chronograph Paris en bon état, un peu d'usure sur le métal doré, micro rayures sur le verre et rayures au dos (voir photo). 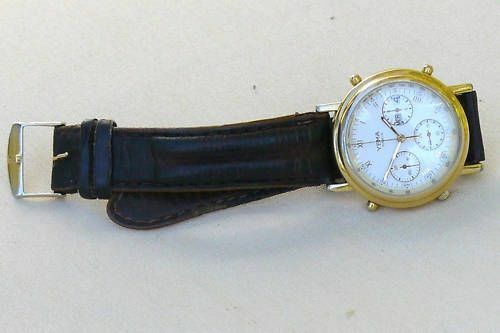 Diamétre 37mm. Je ne sais pas si elle fonctionne. 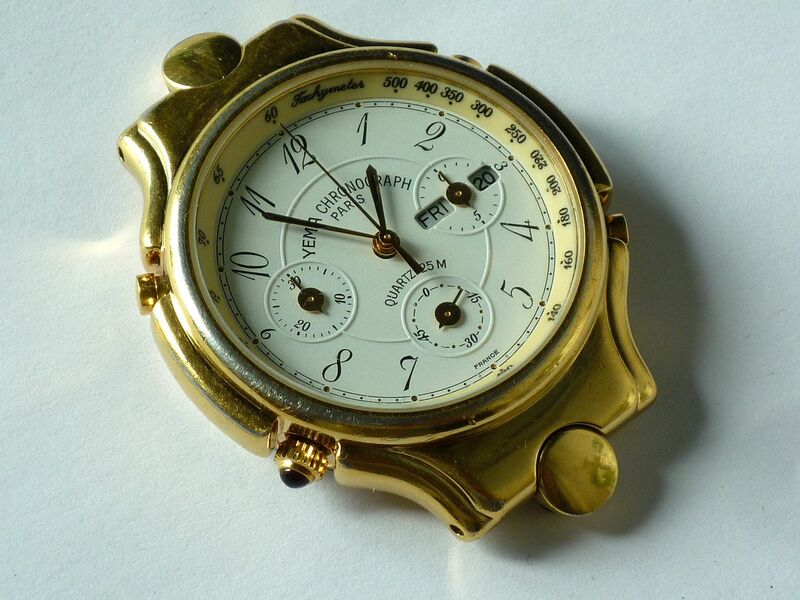 Belle montre. 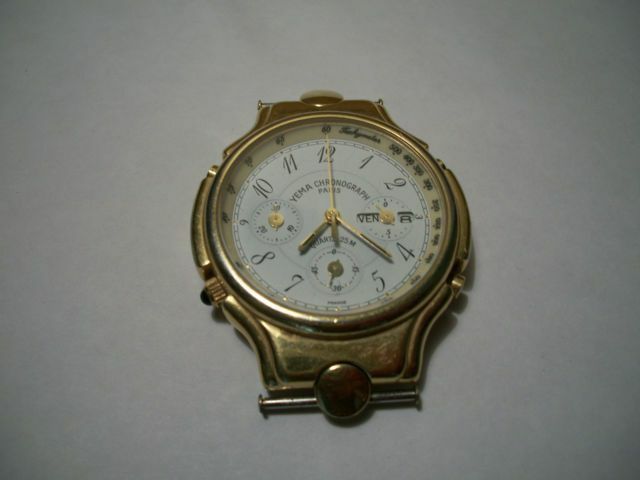 It's not in ideal condition: there's some rubbing wear of the gold plating and the seller stated he's not sure whether it works or not. Which probably implies that it doesn't. Hopefully I might just get away with fitting a new battery, but I'm prepared for the worst. Should make for an interesting little restoration project when it arrives. 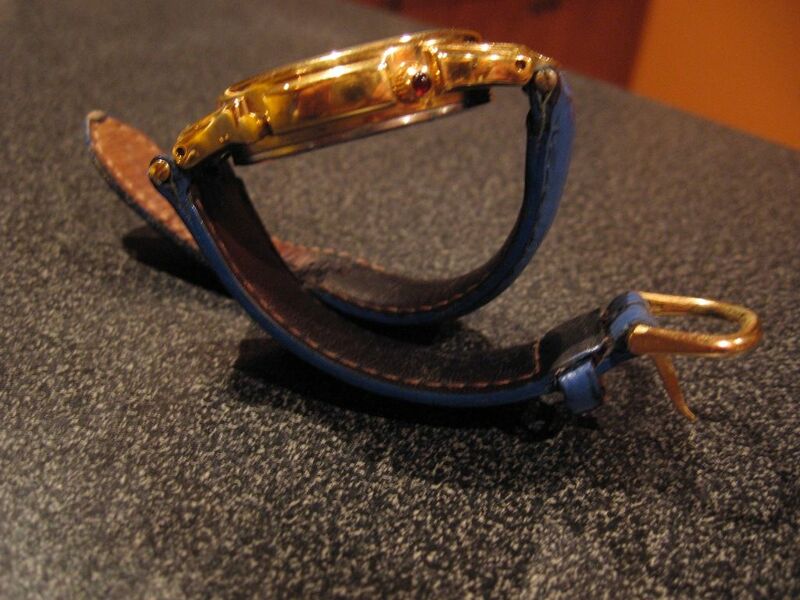 Notching a suitable strap will provide a challenge in itself. Think this one might just end up on the Ostrich leather that I'd originally planned for the N8YX53. Oh - nearly forgot. 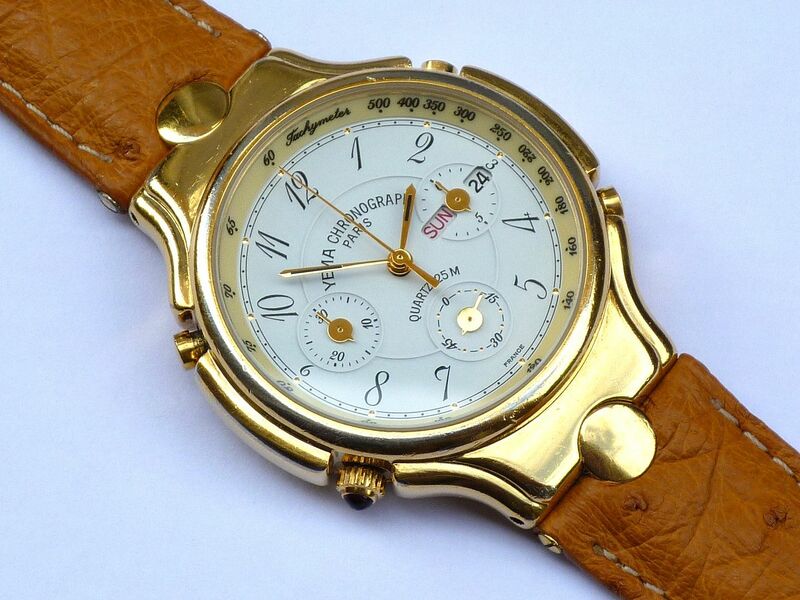 Note the dial is different to Franck's watch. IMO, a rather nicer looking italic Arabic script used for the numbers. Some watches that I buy as restoration projects, in need of possibly just a new battery, or a little TLC don't always go quite to plan. This dressy little Yema N8 YM53 is turning out to be one of those. I was hoping to be able to post photos of the finished article. Ahem. 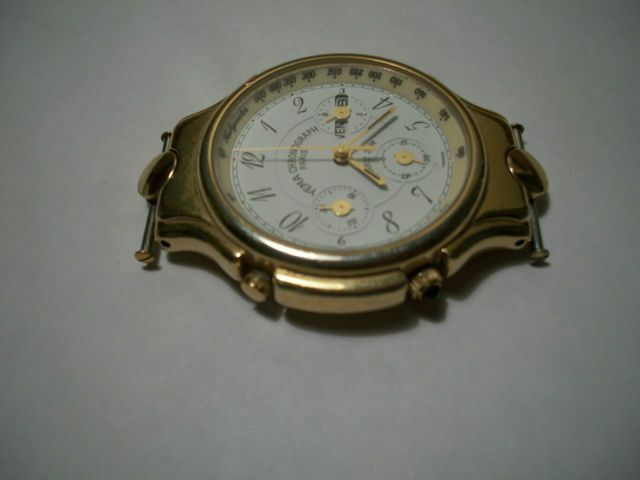 The seller's description included the phrase 'et rayures au dos (voir photo)'. It was immediately obvious from the numerous slipped tool marks on the case-back (most of which weren't visible in his last photo) that he'd had a go at opening it up himself, failed and given up. The tool locating notches on this particular Yema case-back are very shallow and don't provide much purchase. So I first tried using a 'sticky ball' to unscrew it. Not a chance. Undeterred, I resorted to my usual method of tackling tightly screwed on case-backs: mounted it in a watchmaker's vice; that held in a bench vice; carefully set my Jaxa-copy tool to exactly the right pitch diameter, then gave the case-back a quick squirt of aerosol freezer, before successfully unscrewing it, at the first attempt - without adding a single scratch. Unfortunately what I found inside (as you may have already seen from my post in the Tech Tips Battery thread) wasn't a pretty sight. 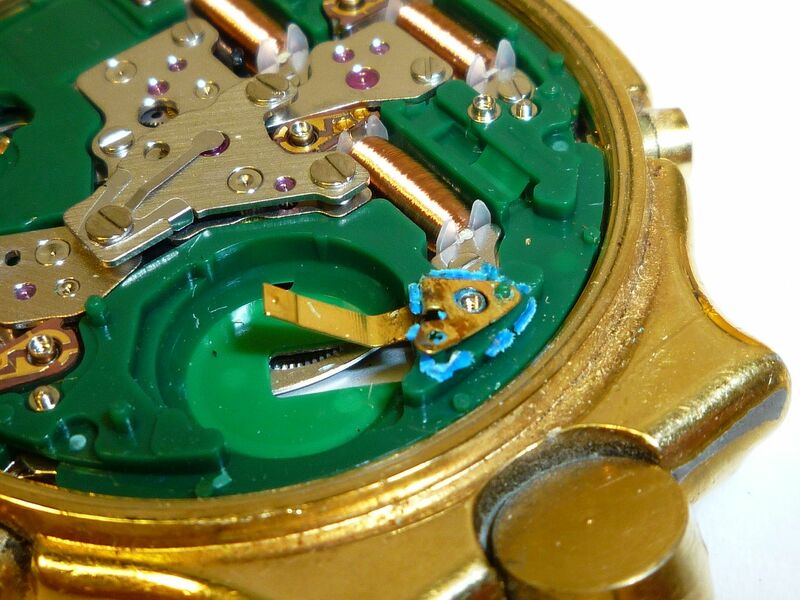 An old run-down Rayovac battery had leaked acid into the movement. I undid the 7 back-plate screws; removed that easily enough and then gingerly started to lift off the PCB. But it was resolutely stuck to both the battery negative terminal and the '710' plastic insulator in that area, so by carefully inserting a wooden cocktail stick under it, I used the negative terminal as a lever, to help pry off the PCB - hence the angle it's at in the photo below. Needless to say, I was very careful not to allow any of those sulphate deposits to drop into the movement. 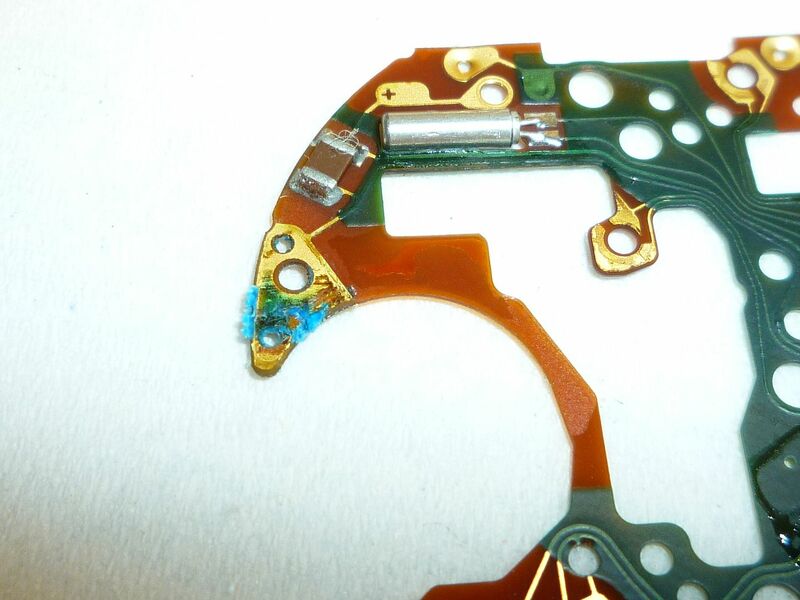 Damage to the PCB appeared to be minimal, other than some loss of gold plating to the negative terminal contact. Reassembled it - popped in a new Renata # 394 battery - result ? Dead as a bloody dodo !! Not so much as a flicker of life ! My money says that PCB won't work. It looks like it should, so it won't!!! This one had looked much more like it should work, but didn't (at all). The irony, eh ? So, naturally I took the (ex-Seiko 7A38) replacement PCB that I'd recently removed from that Orient J39908-70 and fitted that instead. By lunchtime yesterday, the N8 YM53 was ticking away merrily again. Although they're not visible in the above photo, what the seller had also written in his description: 'micro rayures sur le verre' was true. The crystal was covered in tiny scratches. So I popped the old one out, measured it: 30.0mm diameter by a fraction over 1.0mm thick. 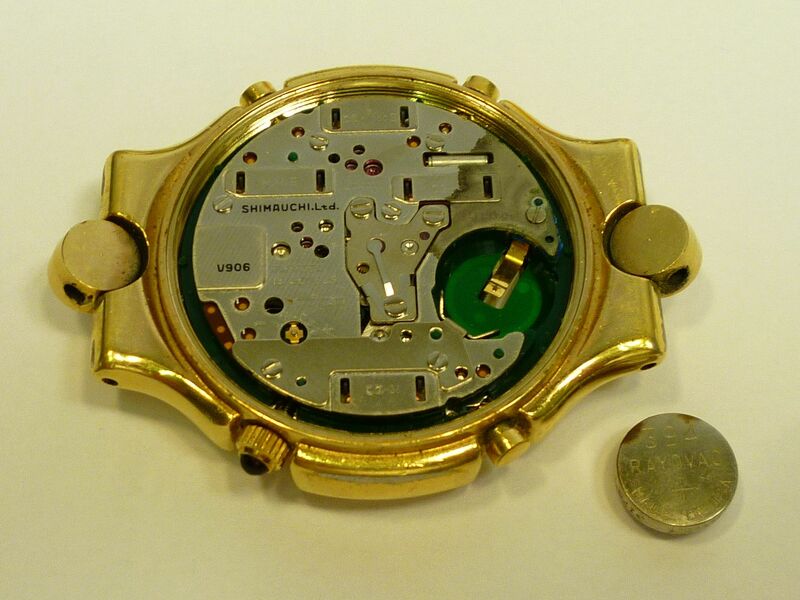 Funny, because if you look at the usual run-of-the-mill 1.5mm thickness we normally use for Seiko 7A38's there are just the two. As the original Yema crystal I'd pressed out was plain, virtually straight sided, I probably should have ordered a Sternkreuz p/n MS300. But instead, I ordered a Cousins 'cheapie' p/n F100CMH300. Don't ask why - put it down to brane fade, rather than penny-pinching. It arrived in the package from Cousins, in this morning's post and has a small but distinct polished bevel edge to it, which in re-using the existing nylon crystal gasket - to achieve the best seal, really didn't leave me with much option but to fit it with the bevel upwards. As you might be able to tell from the above photo, I've given parts of the case a very light polishing - wary of the worn gold plating. So why isn't it on my wrist, with a customary photo posted in the WRUW thread already, you may be wondering ? 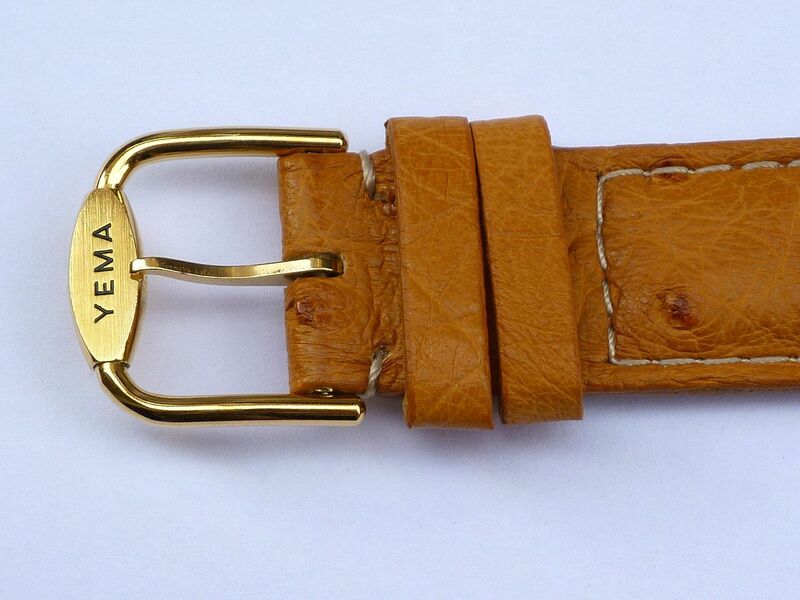 I'd been deliberating about what kind of strap to fit, from almost the minute I'd won the eBay auction. It needed to be 'dressy'. 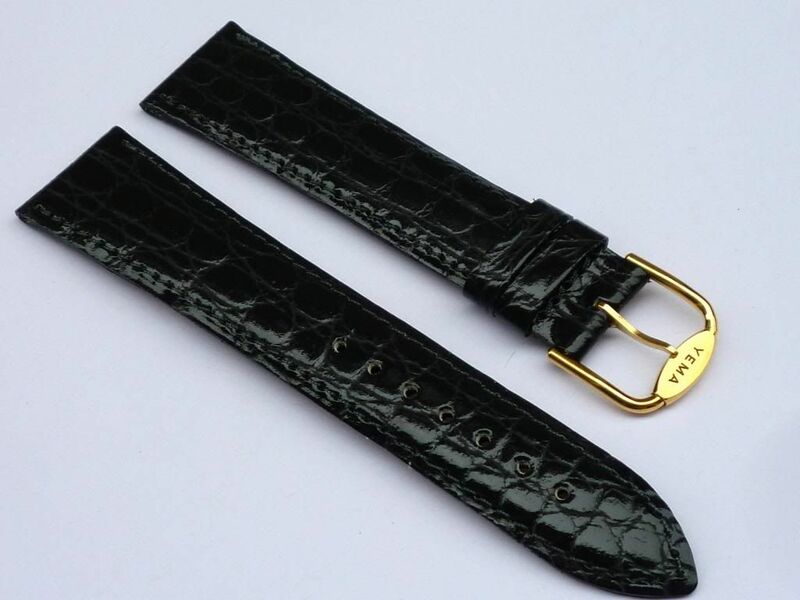 Somewhere in my strap drawer, I'd remembered I had a black patent 'mock croc' Yema strap, fitted with a Yema logo'd buckle. The Yema screw bars are 19mm long. 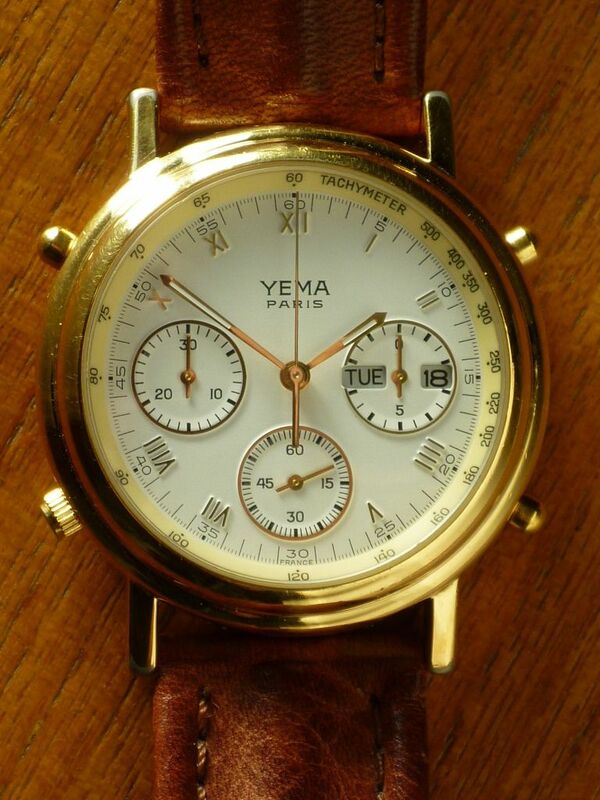 If you look at the photos of Franck's Yema N8 YM53, I suspect he may have fitted a 18mm strap. So it was back to my other alternative idea of the Cousin's Bellini Ostrich strap - despite my previous misgivings about tapering straps. 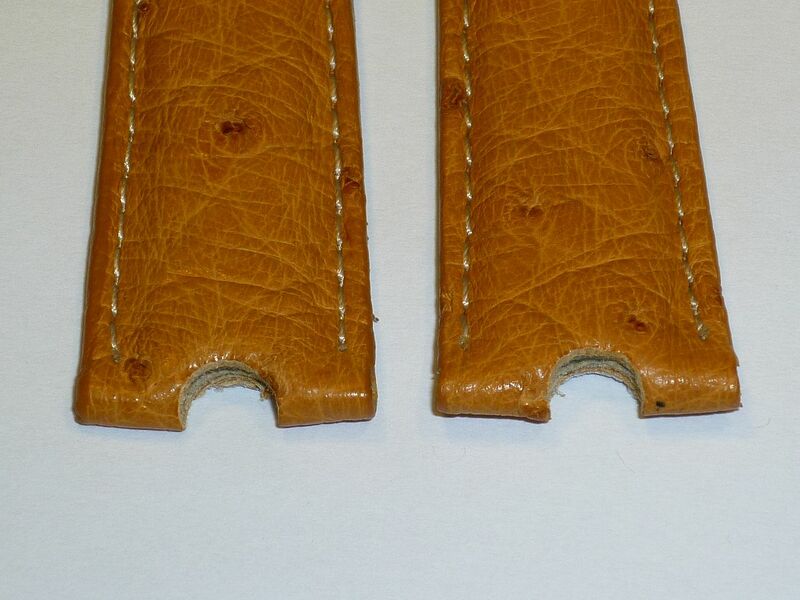 Problem with Ostrich leather is that it's a natural material. 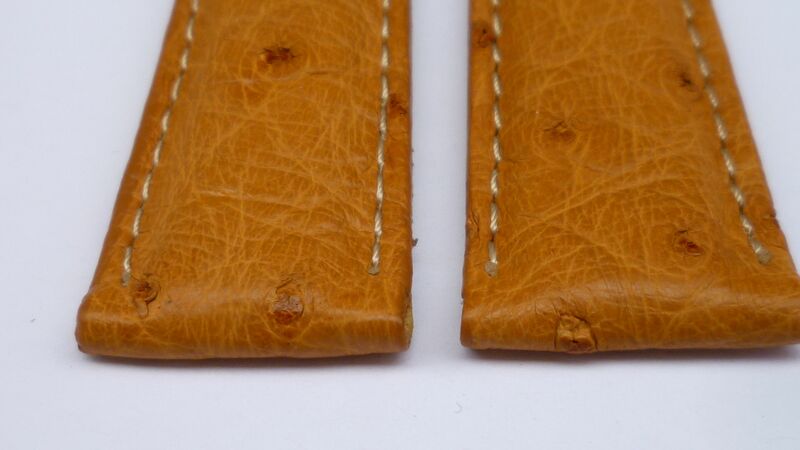 I did think, when I ordered it, about phoning Cousins and asking them if they could pick me one without any quill follicle marks near the spring bar ends, because of my need to notch the strap in the middle. But knowing generally how unhelpful they are in such matters, I thought soddit, why bother - and decided to just chance it. Could those quill marks have been in any worse place ? Scary innit ? How time flies. I can hardly believe it's 11 months since I nearly finished writing up this thread. due to the potential for screwing up. This morning I was in the garage and found a ¼" hole punch I'd once used for making gaskets. So this afternoon I decided enough was enough and after a couple of practice attempts on an old strap, armed with said punch and hammer .... two deft blows to that 25 Quid strap later, more by luck than judgement (or accurate measurement) I'd notched it.